DETROIT -- Ford Motor Co. today posted its largest-ever North American quarterly profit and its best automotive profit since 2000, as net income rose 44 percent in the second quarter. And, most notably, it managed that gain without any additional help from the redesigned F-150, which didn’t reach full production until early June. Lower sales volumes and costs related to launching the truck offset the benefits of higher transaction prices in the quarter, executives said. “F-series did not positively contribute to the bottom line in the second quarter because it was still in launch phase,” CFO Bob Shanks said on a conference call with analysts and reporters. But with inventories of the F-150 now rising -- Ford has promised that dealers will have normal levels of it by the end of September -- the automaker says it’s on track for one of its best years in its 112-year history. Fields reaffirmed the company’s projection for a full-year pretax profit of $8.5 billion to $9.5 billion. It earned $4.27 billion before taxes in the first half, meaning the second half could be as much as 22 percent better. After taxes, the company posted second-quarter net income of $1.9 billion. Revenue declined 0.3 percent globally, but operating margins rose to 7.2 percent, from 6.6 percent a year ago. Ford said revenue rose 10 percent in North America and that margins there could end the year in the upper end of the 8.5 percent to 9.5 percent range it previously projected. The performance significantly beat analyst estimates. Ford’s after-tax profit was equal to 47 cents a share -- the consensus on Wall Street was 37 cents. Ford shares rose 1.9 percent to close the day at $14.83. Ford said its North American pretax profit of $2.6 billion was helped by $526 million from higher prices and a $219 million reduction in incentive spending. “We were kind of getting the best of both worlds at the same time,” Shanks told reporters at Ford headquarters. 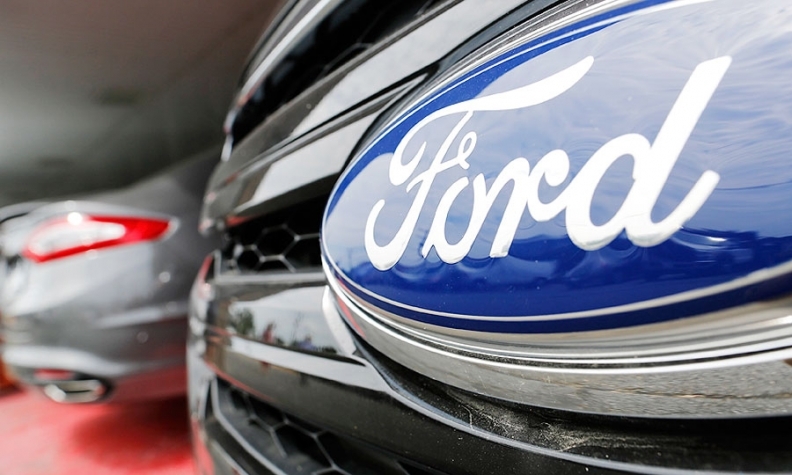 Ford reduced its losses in South America to $185 million and posted a $14 million loss in Europe. The Middle East & Africa region swung to a $46 million loss, but Ford set a second-quarter record in Asia Pacific with a pretax profit of $192 million, up 21 percent from a year earlier. Profits at Ford Motor Credit increased by 17 percent to $505 million. The strong performance in North America overshadowed everything else, though. The 10 percent gain in revenue came even as Ford’s U.S. sales rose just 1.7 percent in the second quarter, compared with 3.3 percent for the industry overall. F-series sales dropped 6.5 percent in the quarter. After retooling both of the plants that build the redesigned F-150, production reached full speed in early June. At the same time, Ford has significant pricing gains in its favor. Average transaction prices for the F-series, including both the F-150 and Super Duty, rose $3,700 in the first half of the year, to $44,000. Ford last week announced a new “Limited” version of the F-150 that’s expected to cost at least $60,000. Shanks said incentives on the F-150 were the lowest in the segment, despite widely publicized discounts offered on “selected vehicles in selected markets.” Ford achieved those pricing gains even though it built about 25,000 fewer F-150s in the first half of 2015 than it did a year ago, he said. Fields has repeatedly described 2015 as a “breakthrough year” for Ford, with heavy investments in new products beginning to pay off. Fields has said the bulk of Ford’s profits this year would come in the second half, which is the opposite of the usual pattern for automakers, due largely to the F-150 changeover.